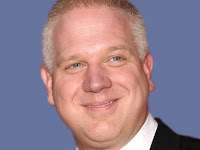 Glenn Beck, Grover Norquist and a particularly extremist group of far-right (Tea Party) Republicans are trying to get Congress to hold strong against increasing the tax rates on the top 2% of American wage earners. On 12/12/12, Lawrence O'Donnell took up the question of a Republican-led House of Representatives raising taxes in response to a small press conference help by some of the most extreme members of Congress earlier this week. Republicans and right-wing commentators keep arguing that the United States has a "spending problem," but that was not the case until President Bush 1) cut taxes, 2) passed Medicare Part D without paying for it and 3) waged two wars (Iraq and Afghanistan) without raising taxes to pay for them, the first time in history any president has shown such fiscal irresponsibility. This is why the federal budget is out of balance. The fact is, the United States has a revenue problem. The Tea Party types like to argue that we are "taxed enough already" (TEA). That is true for the 98% that most Congressional Democrats and the President are trying to keep taxes low for. However, tax rates on the wealthy have been historically higher, and those people thrived during those periods of high, marginal tax rates. [S]pending is not out of control. Entitlement programs like Social Security and Medicare are rising gently as the baby-boom generation retires. All other spending, including that for the military and domestic discretionary programs, falls—with the notable exception of interest on the debt. Interest rises sharply as the deficit rises, principally because the G.A.O. assumes that revenue will not be permitted to rise above its historical average—as Republicans continually insist. How high should the marginal tax rate (on the highest income earners) go? A key idea to easily understand how much the top marginal tax rates could increase is provided by the infamous (in some progressive circles) Laffer Curve. Just as Laffer argued in the early 1980's that tax rates were too high and needed to be decreased to maximize government revenues, it is more obviously the case that top, marginal tax rates are too low now. For Beck, Norquist and other 19th Century liberals (reactionaries), it is government spending that is too high, but that cannot be the case during or coming out of an economic downturn. It is temporary government spending that serves as a bridge to economic recovery for the private sector. Although the crisis phase of the Great Recession is behind us, there is still need for government spending to hasten a sluggish recovery and to invest in future economic global competition with better education and job training. It just needs to be paid for. If the debt is a crisis as conservatives argue, then they must face the need for increased revenues now and again during the 114th Congress. You can decide for yourself if you think top marginal rates should be that high. After all, revenue maximization isn't our only social goal. 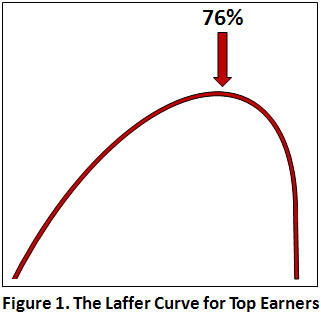 Roughly speaking, though, this is a calculation of the peak of the famous Laffer Curve. (For top earners, anyway.) Above 76 percent, you really can generate higher revenues by lowering tax rates. Below that, higher rates generate higher revenue, just like you'd think. Note that this is a result that both liberals and conservatives ought to take some satisfaction in. For liberals, it's confirmation that current tax rates are far, far below the Laffer maximum. We can raise marginal rates from 35 to 40 percent with only minor deadweight losses. For conservatives, it's justification for the 1981 Reagan tax cuts. When top rates were at 70 percent, reductions may not have literally paid for themselves, but they probably lowered revenue fairly modestly. We really were pretty close to the Laffer maximum in the '60s and '70s. Too many representatives in Congress are representing those who paid for their campaigns to get into office, the 1%, and not the majority of voters. Taxes on the wealthy need to go up, and the Laffer Curve shows that they can do so appreciably without adversely affecting the economy. Hopefully in 2014 voters of all political stripes will realize that the anti-tax rebels allied with Grover Norquist and/or Glenn Beck need to be displaced from office. Otherwise, in years to come, we will have a deficit and debt problem. Think about fiscal responsibility and please keep those comments in mind when you vote in 2014.